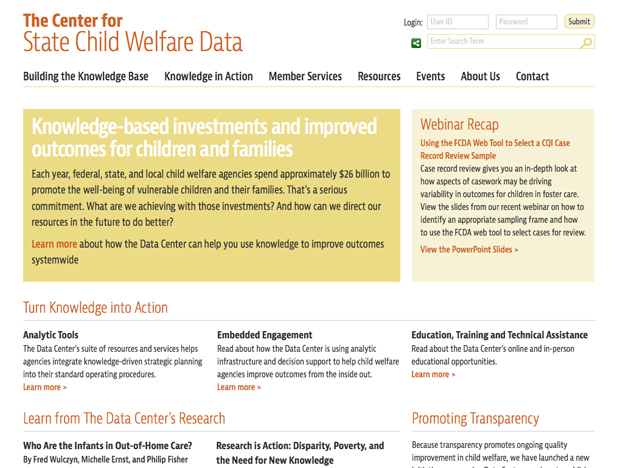 Established by Chapin Hall at the University of Chicago in 2004, the Center for State Child Welfare Data (known as the Data Center) works to turn vast amounts of data from state child welfare agencies into knowledge, which is then used to inform decision making around resources and ultimately, to improve outcomes for children and families. One of the most enjoyable aspects of this website project was providing guidance in organizing and developing the site content. Communicating with a broader audience is a fairly new endeavor for the Data Center, and our ‘outsider’ status benefited the process. Together, we took a potentially overwhelming amount of information and made it digestible.